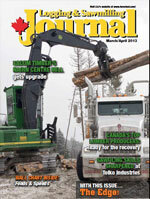 Does your sawmill match your usage plan? Taking the time to conduct some research in advance of an investment can help make owning a sawmill a very positive and rewarding experience. Toso Bozic, Bioenergy Specialist and Agroforester with Alberta Agriculture and Rural Development, says that there are good business opportunities in sawmilling, particularly with a focus on custom sawing and re-sawing, as well as production of hard-to-find niche products. For example, timbers in various dimensions are often in demand by acreage owners, cottage owners and oil companies, the last for use in pipeline and general oilfield construction. Other examples of potential products are siding and paneling like tongue and groove and shiplap, as well as flooring products not readily available in retail stores. Small sawmill owners should avoid trying to compete with lumber retailers selling dimensional lumber. But is the intention to operate the sawmill as a business? Potential sawmill owners should ask themselves early on if they intend to operate the sawmill as a part-time or full time business or as a hobby where they use the manufactured wood products themselves. Another important consideration is the wood source. Many landowners already have softwood and hardwood timber that is available. Other potential sources are local and commercial timber permits offered by the Alberta government as well as wood salvaged by oil and gas, mining and power companies. With a list of potential customers and an identified source of timber in hand, the question now becomes what style of sawmill best fits the sawmiller’s needs. When searching for equipment, Bozic says purchasers should consider both the new and used market. The two most popular sawmill types are circular and band mills. The main difference between each type of sawmill is recovery versus production. Because of the thinner kerf on a band mill blade, it is able to convert up to 20 per cent more lumber from each log compared to a circular sawmill. On the other hand, circular sawmills can cut much more lumber in an eight-hour day. The decision on what style of sawmill is the most appropriate often depends on what products are in highest demand and what customers are willing to pay for them. If sawmillers can earn a sufficient premium on band mill products, it may be economical to sacrifice production for higher recovery per log. Each type of sawmill will also require regular blade sharpening and the equipment to do the work. Another sawmill option is a chainsaw mill. While it is a low cost, extremely portable option, it cuts much wider and larger lumber than circular or band mills. 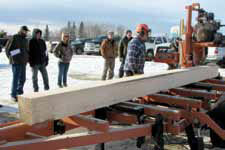 Sawmillers should also evaluate if a portable or stationary sawmill best suits their needs. In some instances, it may make more economical sense to transport the sawmill closer to the timber source, than to transport the timber to the sawmill. The objective should be to generate minimal waste and maximize recovery from each log, keeping in mind that each sawn log will produce sawdust and slabs. These slabs can be packaged and sold as firewood or sold to farmers as inexpensive corral fences. Sawdust and planer shavings have potential as animal bedding. These waste products can also be used as bio-energy to heat farm or acreage buildings. Finally, additional equipment such as edgers, moulders, planers, trucks and wheel loaders may be required to support the sawmill. Potential sawmill owners should consider if this equipment is needed and how much it will cost to purchase and operate this equipment. Operating the sawmill may also require hiring employees because of the amount of labor involved when producing wood products. A little homework goes a long way when purchasing a sawmill. Optimization is the key word driving forest companies these days, with a strong focus on designing their facilities to capture as much value as possible from their wood basket. For that reason, the work being done within the Canadian Wood Fibre Centre’s (CWFC) Lodgepole Pine Partnership Project to refine the industry’s knowledge of its resource prior to harvesting has captured its attention. The partnership is a research collaboration involving the CWFC, other Canadian Forest Service researchers, provincial governments, industry, and organizations like the Foothills Growth and Yield Association and the Foothills Research Institute, working to improve knowledge about the lodgepole pine resource in British Columbia and Alberta. Jim Stewart, CWFC Research Scientist in Silviculture and Fibre Production, says CWFC’s goal as a project participant is to help industry improve its competitiveness by maximizing the value it captures from the lodgepole pine resource. Having a more refined knowledge of the resource not only helps existing facilities capture more value, but also helps companies make good decisions on how and where to invest capital in their facilities. The partnership research program is focused in three areas—forest inventory; modeling wood attributes; and evaluation of silviculture treatments in long term trials. Stewart says the research is a combination of developing practical tools and procedures that industry can use now, with longer-term wood fibre evaluation research that will help forest managers meet demand for future forest products. The Alberta government made the substantial investment to licence LiDAR data for most of its forest green zone and has made it available to forest companies, minimizing the financial risk of trying the new technology. Stewart says that this has resulted in widespread adoption of LiDAR as an inventory tool in Alberta and is expected to save forest companies money in both planning and processing. West Fraser is using the tools and procedures developed by the researchers in its inventory planning and other companies are benefiting from presentation of the results in workshops and individual consultations. The partnership has also developed a Best Practices Guide on the use of LiDAR as a forest inventory planning resource. The research on forest inventory tools is closely related to research modeling wood attributes such as wood density, micro fibril angle, and fibre coarseness, with the latter focusing on predicting the internal wood attributes of lodgepole pine stands based upon external tree characteristics and influences. Stewart described research aimed at gathering and interpreting data on internal wood attributes as a very challenging and long term endeavor because the attributes can vary greatly and can be difficult and expensive to measure. Research has been focused on developing models that will provide industry with internal attribute evaluations of their wood baskets that they will find useful, given the level of sophistication that sawmills operate within today, such as predicting the proportions of juvenile and mature wood in a log. The Lodgepole Pine Partnership has resulted in better planning tools for industry. 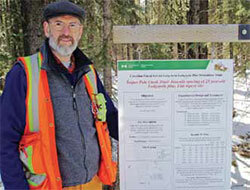 For more information about the Lodgepole Pine Partnership Project, contact Jim Stewart at (780) 435-7224 or jstewart@nrcan.gc.ca. Through using a wood-derived material called cellulose nanocrystals (CNC), there is an opportunity in the short term for the Canadian forest industry to provide replacement products for conventional petroleum-based plastics that are used to make products such as Styrofoam cups and molded packaging. 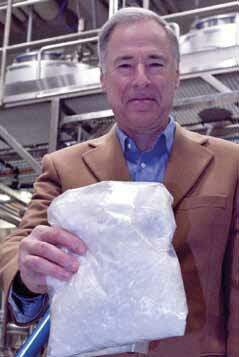 Dr. Bruce Lyne holds a bag of crystalline nanocellulose extracted from wood fibre. Formerly known as nanocrystalline cellulose and now called crystalline nanocellulose in a proposed ISO standard, the material provides an environmentally friendly alternative to petroleum-based plastics that can be made bio-stable but bio-degradable at end of use. That is according to Dr. Bruce Lyne, who is well-known in Canadian forest industry circles for his past work with Paprican, as Director of Corporate Research at International Paper, President of the Institute of Surface Chemistry, and is currently Professor at the Royal Institute of Technology in Stockholm, Sweden. The three areas he has identified as most promising are: moldable packaging materials in which CNC forms both the barrier to moisture and oxygen as well as the strength layer; automotive interior components like dashboards, seat cushions and interior moldings; and CNC as a rheology modifier or structuring agent in products such as paints, adhesives, cement and drilling muds. CNC is a nanoscale, environmentally benign, and recyclable material that is derived from plant cellulose such as wood fibre. The most common origin for CNC is from fully bleached kraft pulp, so there are good, potential synergies for the forest industry to extract CNC simply by integrating its production within existing infrastructure. With its strength properties, CNC is also particularly valuable when added as a reinforcing agent to bio-composites, in relatively small quantities (e.g. four per cent). In fact according to Dr. Lyne, the strength properties of CNC are “comparable to Kevlar”, a material used to produce bullet-proof vests. Dr. Lyne was contracted by Alberta Innovates Bio Solutions (AI Bio) in 2009 to help the Alberta government and forest industry identify potential markets for CNC. He was recently commissioned by AI Bio to update his 2009 findings. Dr. Lyne presented his findings at a recent seminar entitled “Exploring Biomaterial Opportunities”, which was held in Edmonton at the facility of AI Bio’s sister organization, Alberta Innovates-Technology Futures (AITF), and hosted by the Alberta Biomaterials Development Centre in Edmonton. The Centre is a virtual portal to bio-product expertise and infrastructure within Alberta. During his presentation, Dr. Lyne said that about one-third of all petroleum-based plastics are currently used in packaging and it has become an environmental problem. Plastic packaging materials now commonly wash up on beaches worldwide and countries like China are trying to ban the use of materials such as Styrofoam. However, it hasn’t been able to find a bio-degradable alternative—and consumption of this material increases by seven per cent a year in Asia. This is a market that the forest industry should be able to easily penetrate, Dr. Lyne said, because the industry is already well acquainted with supplying products to the packaging market. CNC has shown to be ideal for stabilizing and reinforcing natural polymer foams—it is even possible to make bio-degradable foams of pure CNC that have similar properties to Styrofoam. Costs can be kept in line by harvesting the CNC from paper mill waste streams. “I think there was just as much to be gained from what Bruce told us not to engage in, as what to focus on,” says Steve Price, Executive Director for Advancing the Bio-economy at Alberta Innovates Bio Solutions. In terms of future CNC production investment in Alberta, Price says it will likely be focused on capturing CNC from waste streams associated with the pulp and paper sector, and future market opportunities will drive their level of interest. He was pleased to hear that AI Bio’s support for research in Alberta that is focused on investigating CNC’s rheology (i.e. flow properties) is well placed. For more information, contact Steve Price at steve.price@albertainnovates.ca or (780) 427-2567. To view Dr. Lyne’s presentation, visit www.bio.albertainnovates.ca/media/53002/2013feb12-marketprospectsfornanocellulose-brucelyne.pdf.